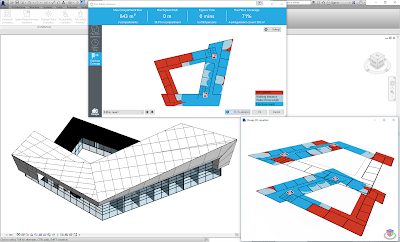 Xinaps is known for creating smart building checking tools to simplify and optimize the building design process. Their current stable of products include Xinaps Spatial Requirements Assistant, Xinaps Financial Simulator, and Xinaps Daylight Ratio Evaluator. We're told that they plan to offer a sneak peek of two new patent-pending products during RTC Europe nex week, Xinaps Accessibility Evaluator and Xinaps Fire Safety Assessor. So, what to expect in these new add-ins? Here we discuss Xinaps Fire Safety Assessor. For Xinaps Accessibility Evaluator, see this post. Xinaps previously announced their collaboration with Saval to empower fire safety analysis for Revit based on Saval's fire extinguishers. 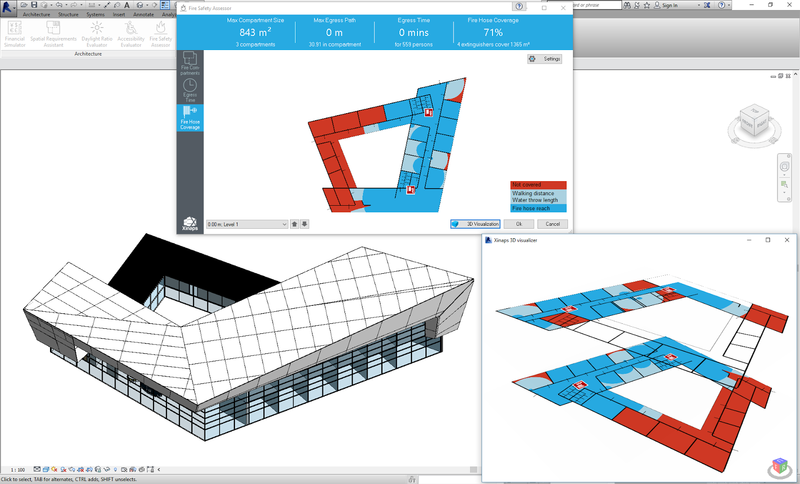 They will be the first in the world to publicly provide a fire safety app for Revit. Modelers will be able to analyze and visualize data in the preliminary design phase of the building. check fire compartments. For instance, defined by any Room Parameter, for maximum compartment size, required fire exit width, and maximum egress path lengths. quickly analyse the evacuation time needed to allow all people to egress the building. The maximum capacity flow works tightly together with your Revit model including door sizes, stair sizes, walking speed, and egress distances. check and visualize the fire extinguishers' floor coverage to make sure they can extinguish fire everywhere in the building. It reads the location and the type of the Fire Extinguisher modeled in Revit. visualize the results into a powerful colored heat map animation of people flow, fire compartment overview, and Revit floor plans. More information about the actual release date and pricing will be available during the sneak peek. Here's a link to the Xinaps website. RTC 2016 EUR will be held in Porto, Portugal from October 20th to 22nd.